Pushing past the constraints of postmodernism which cast "reason" and"religion" in opposition, God, the Gift, and Postmodernism, seizes the opportunity to question the authority of "the modern" and open the limits of possible experience, including the call to religious experience, as a new millennium approaches. Jacques Derrida, the father of deconstruction, engages with Jean-Luc Marion and other religious philosophers to entertain questions about intention, givenness, and possibility which reveal the extent to which deconstruction is structured like religion. New interpretations of Kant, Heidegger, Husserl, and Derrida emerge from essays and discussions with distinguished philosophers and theologians from the United States and Europe. 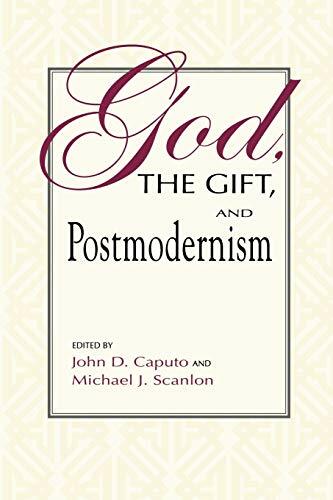 The result is that God, the Gift, and Postmodernism elaborates a radical phenomenology that stretches the limits of its possibility and explores areas where philosophy and religion have become increasingly and surprisingly convergent. Contributors include: John D. Caputo, John Dominic Crossan, Jacques Derrida, Robert Dodaro, Richard Kearney, Jean-Luc Marion, Frangoise Meltzer, Michael J. Scanlon, Mark C. Taylor, David Tracy, Merold Westphal and Edith Wyschogrod. John D. Caputo is David R. Cook Chair of Philosophy at Villanova University. He is author of The Prayers and Tears of Jacques Derrida, Against Ethics, and Demythologizing Heidegger. Michael J. Scanlon is Josephine C. Connelly Chair of Theology at Villanova University.